During Peak-Season Portside rents Sat-Sat mostly in high season. Portside cottage rests 75 feet from a 1000 foot long deep clean red and white sandy beach. 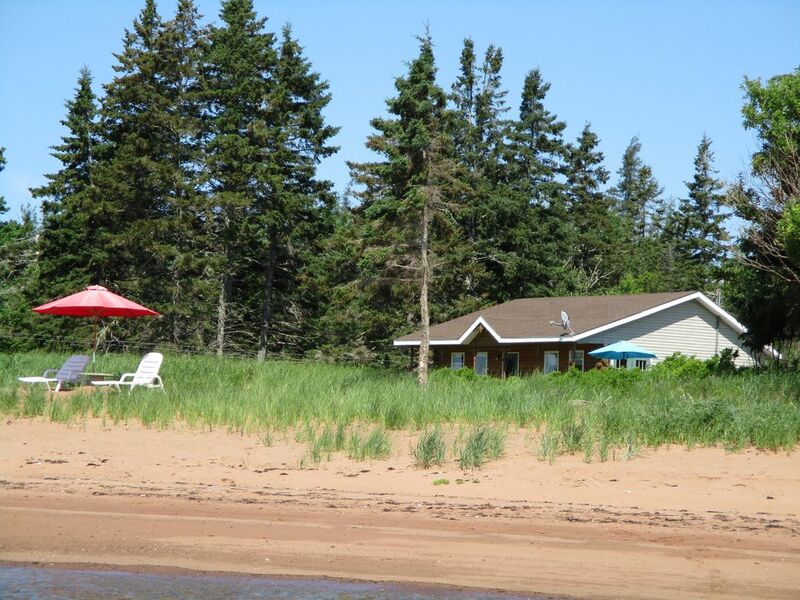 The cottage faces the Northumberland Strait on the southernmost tip of PEI, with the warmest waters and calmest seas on PEI. We have 3 cottages on 20 acres and a completely private lane. You will share the beach with one other cottage whose property borders near Portside. If you love the beach, you will be right at home here. There is a big change in the tide every day. At high tide you can swim or walk along the shore and search for sea glass and other treasures. When the tide is low, you can swim, and take advantage of all the sea life on the sandbars and tide-pools. You can walk for miles on the bare sandbars at low tide or dig some bar clams. There are plenty of chaise loungers, small wooden tables, and umbrellas on the beach to catch some shade on hot afternoons. Portside is a 2 bedroom cottage with cathedral ceilings in the open concept kitchen/living/dining rooms. One bedroom has a queen-size bed, and the second bedroom has a single over double bunk-bed. We offer a single blow-up mattress for any extra guests. There is a view of the Wood Islands lighthouse from all points of the shore side of the cottage. Portside has a 3.5 star Canada Select Rating. We are 1 km from Plough Through The Waves visitor information center with a liquor outlet and shops. Service stations, banking institutions, and grocery stores are located in Montague, a 15 minute drive North. Two golf courses are within 15 minutes. Wood Islands Seafood and Takeout has all your seafood needs with live or cooked lobster, sandwiches, chowder, haddock, clams, mussels, oysters, scallops, salmon, etc. at 84 Lighthouse Road at the Wood Islands Wharf. Darryl grew up here and lives at the back of the 20 acre property. Privacy, beautiful sandy beach with lots of sandbars and tide pools at low tide, lighthouse views, close to restaurants and seafood outlets. Bring your favorite beach towel. 4 foot covered deck on front. 8 by 12' deck on side. Here are some key areas to enjoy on the Points East Coastal Drive. - Panmure Island Beach. Sand Bar & Grill Restaurant. - Basin Head Beach and Fishing Museum. Rates on the table do not include tax. Rates are quoted in Canadian dollars. Check in/out day is Saturday in peak season. Other check-in days will be considered. 50% of the total amount is due at the time of booking, and the remainder is due 30 days prior to arrival. If the unit can be re-rented for the same time period, a full refund will be issued. If it isn't re-rented, no refund will be issued.